Seventeen year old Marin finds herself alone in a broken world. Everyone she knows has either abandoned her or somehow been swallowed up by the misery that has become day to day life. Marin struggles to survive alone. After the government has failed to contain the zombie outbreak the nation has crumbled, there is no law and order. If it weren't bad enough to have to outrun the violent creatures whose sole desire seems to be to devour you, Marin must also manage to avoid the strangers left in the world who find the end of society to mean the end of any morals. Marin has decided to set out on a quest to find a place where the zombie infection has not reached. She is not sure if it's a myth, but she is sure a life without hope would leave her with nothing. On her journey she manages to meet Zac and his sister Alice. Unsure if she can trust him, Marin is guarded around Zac, but believes she will be safer traveling with him then without. Will Marin regret her choice to trust Zac? 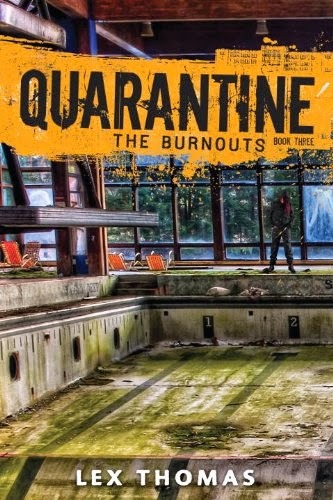 Will she ever find a place free from the virus that caused the outbreak of zombies? Will Marin lose all hope or even her life? Ruination follows a small group of survivors as they seek safe haven in a world overrun by Zombies. Marin is 17 years old, has just lost her companion and is desperately trying to make it to Tribecca a town rumored to be Zombie free. Alice and Zac are siblings who happen to find Marin in an abandoned school and reluctantly agree to let her join them in their travels. 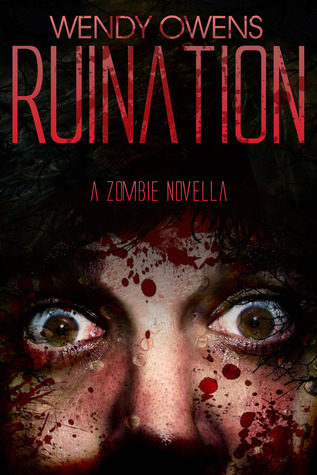 The plot of Ruination is your standard Zombie fare. Zombies bad, people sometimes good, Government is in disarray etc... if your looking for something fresh and unique this isn't the book for you. However, if you don't mind the standard Zombie formula you might actually find this enjoyable. Some of the things I did like about Ruination were the pacing and the world building. I breezed through this book and it kept me pretty sucked in despite the very entertaining movie on TV demanding my undivided attention. I also liked that we get to know enough about the characters and the world they live in despite the book only being novella length. On the other hand I do have some complaints with this Novella and unfortunately they are some big ones. First off, I hated Marin the majority of the time. Her character is just to stubborn for her own good and despite being told time and again not to do this or that she defiantly doesn't listen. How she ever survived as long as she did is honestly beyond me. Secondly, nothing tees me off more than people insisting children need protection during the Zombie Apocalypse. I'm not talking about keeping them safe. It's a given children should be kept from physical harm. I'm talking about shielding them from every bad thing that comes along or my favorite no cussing allowed around them. Um hello?!? It's a Zombie Apocalypse. Sunshine, daisies, puppies, all that is gone. It is survive or die. Once a child is past toddler stage it's time to stop the coddling. If any child is going to successfully survive a Zombie apocalypse they need to get used to the Zombies. They need to know not all people are helpful and that good people are sometimes killed not just by Zombies but by their own hands as well. Zac keeps his sister so well protected that when a real threat pops up she runs straight into its waiting teeth arms. Lastly, I felt the ending was a bit rushed. Everything was plodding along nicely and then it just went from safety to kissing to oh look security breach the place is overrun. Had a few more pages been spent on them settling into life in the safe zone the breach might have had a bigger impact. The way it happened it didn't really feel like that big a deal that they lost it so quickly. Overall, I liked Ruination despite all its faults. I might even read the sequel whenever it's written and released. Which I guess begs the question. Would I recommend this Novella? Yes, but I like I mentioned above if your wanting something unique this isn't the book for you. With that being said, I will be rating Ruination by Wendy Owens ★★★. Yeah, I can see why you would have issues with shielding children from cussing during the zombie apocalypse. That seems a bit ridiculous. I always struggle with novellas because I don't feel like there is enough time to flesh out a believable storyline and it sounds like the ending did this one end. Oh well it still sounds like it was fun as far as zombies go! Thanks so much for signing up to do Apocalypse! You have the perfect themed blog for the event! It's not that I want people to cuss all willy nilly around the children but c'mon if someone swears it's not the end of the world. I'm of the mind don't make a big deal out of it and the kid won't think much of it. When you treat swears like forbidden objects that's when they push boundaries and want to use them.